diff is used to show the changes between two versions of the same file. 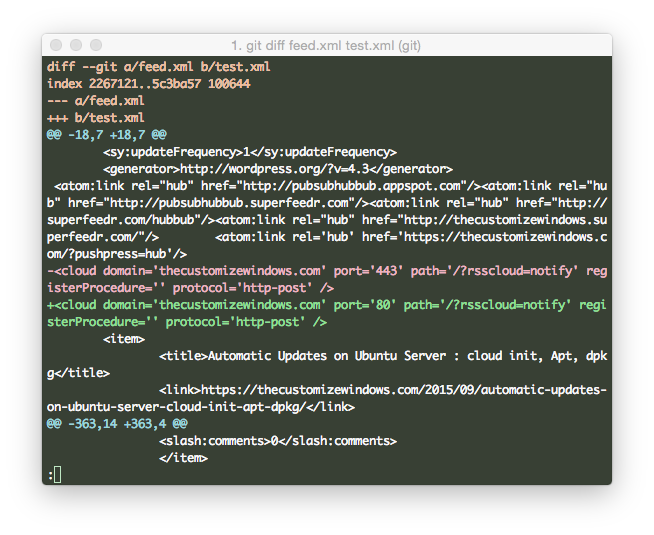 Colorful diff on Command Line is Great to Read & There is Easy Way. man diff will bring the default diff utility’s manual page. We can use this tool, but there is an existing easy way. First we will talk about the ways which many like to use, next we will talk about the easy way we like. This Article Has Been Shared 2792 Times! Here is a Nano Plain Text Syntax Highlighting nanorc File For Highlighting Certain Words, Commented Out Sections While Writing as Plain Text. Typekit allows to embed fonts into online documents through CSS to render perfect looking fonts. With Retina display, quality of rendering becoming a factor. Apple has its cloud storage service with iOS 8 with the name iCloud Drive. The service provides functionality similar to other cloud storages. Cite this article as: Abhishek Ghosh, "Colorful diff on Command Line : OS X & GNU/Linux," in The Customize Windows, September 14, 2015, April 21, 2019, https://thecustomizewindows.com/2015/09/colorful-diff-on-command-line-os-x-gnulinux/.